Summer is here and it is already HOT outside. As we gear up to go to the pool to cool off we have to make sure and protect our skin from sun damage. We all know we should avoid tanning beds and apply sunscreen to avoid getting a dreaded skin cancer in our future. 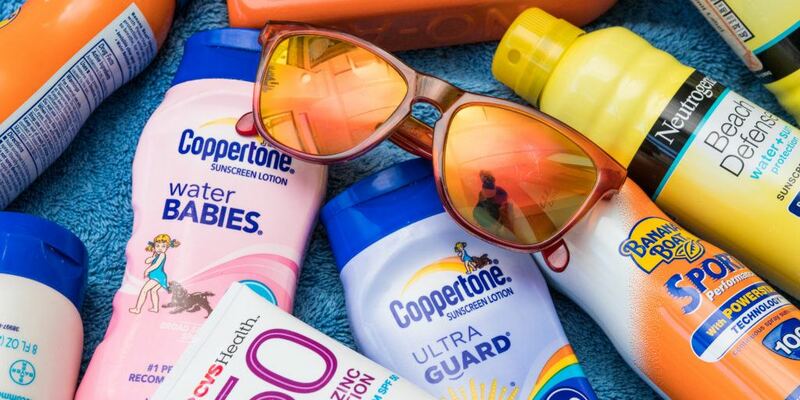 The confusing issue comes when you make your Target run and see hundreds of sunscreen options and have no clue which one is actually worth your money. So what sunscreen should you wear? How often should you reapply it? Is SPF 100 really better than SPF 30? If your skin is a fair complection or have a family history of skin cancer you should consider wearing an SPF50 sunscreen to sun exposed areas. Otherwise most people can get away with wearing SPF30 when sun exposed. There is no data proving that any sunscreen greater than SPF 50 really works all that much better. So it may not be worth your extra money on the higher SPF when shopping. If you take the SPF and multiply it by 10 you can get an idea of how long it will protect your skin from a sunburn without sweat or water involved. Reapply sunscreen immediately if you get your skin wet from sweat or swimming. If you know you will be sweating or swimming then use a water resistant sunscreen. Everyone should wear a daily facial sunscreen(EVEN IN THE WINTER AND ON A CLOUDY DAY) The face takes UV rays on daily whether we are by the pool or walking across the parking lot to go to work so it’s highly recommended to wear a SPF 30 sunscreen to your face every day of your life. My personal two favorite options are Dermalogica Oil Free Matte SPF30 or for days at the pool I love SkinCeuticals water resistant SPF50. However, find one that works as a good daily moisturizer for you and apply every morning. For kids, avoid sun exposure or sunscreen until after age 6 months. Utilize big hats, sunglasses and swim shirts to protect their sensitive skin. My personal favorite sunscreen that I use on my own kids is Baby Organics SPF 50 sunscreen. For those of you who have already unfortunately had a non melanoma skin cancer (ie basal cell or squamous cell) in the past you may want to consider taking Vitamin B3 500 mg twice daily. Recent studies have shown that this simple vitamin may decrease your risk for an additional non melanoma skin cancer by up to 20%. Finally one of the best ways to protect your skin is to get an annual skin check to make sure there are no concerning moles or lesions that need to be further investigated. We offer this to all of our patients. If we find something concerning we can offer biopsy for diagnosis or appropriate treatment to get rid of the lesion. Simply call to schedule an appointment 417-332-3639.